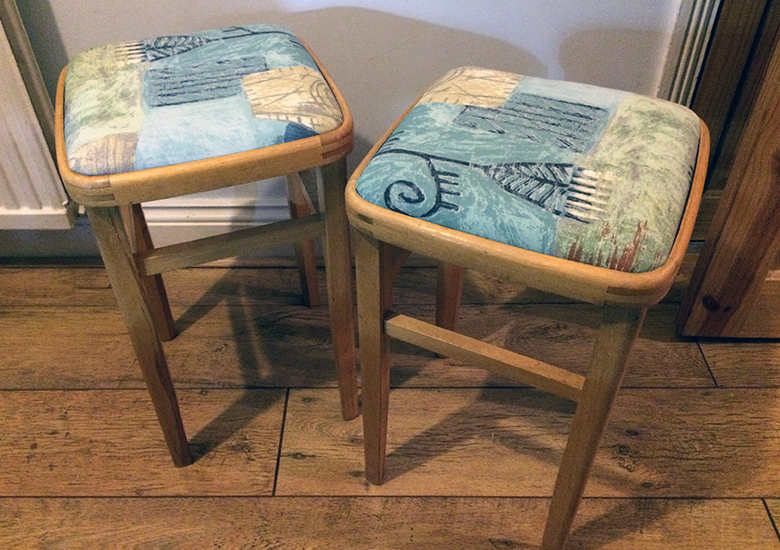 I recently bought a couple of 1950s stools from a local junk shop. I love this style of furniture as its simple, robust and very functional. 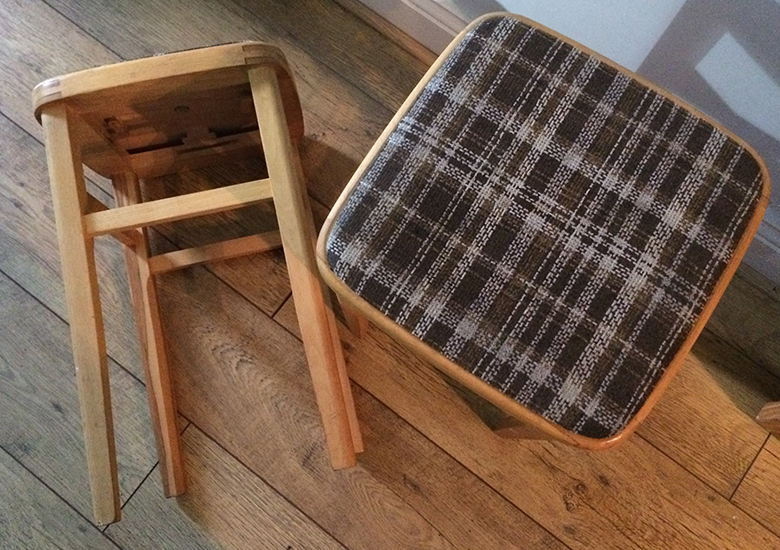 The stools were structurally very solid, but obviously the upholstery was in need of some updating! 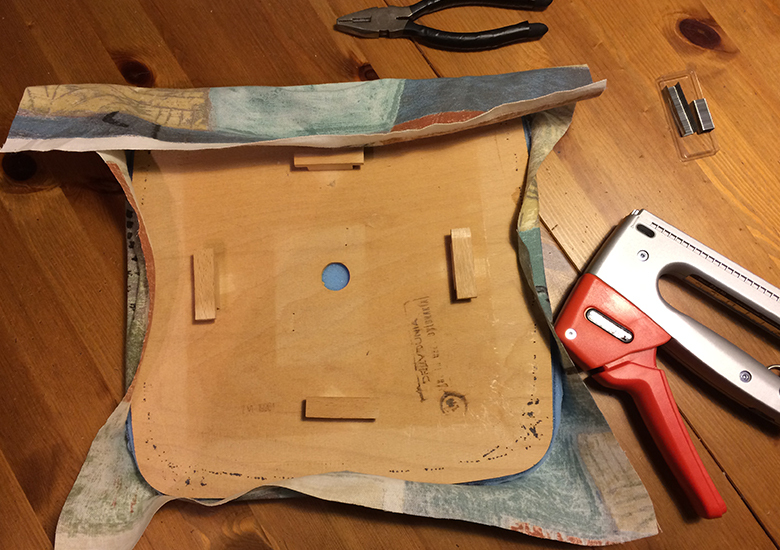 These are the simple steps I took to reupholster them. The first step was to remove the drop-in seat. To do this there were four simple wooden pegs that spin around to lock/unlock the top from the base. Once lifted off the next step was to remove the old fabric. 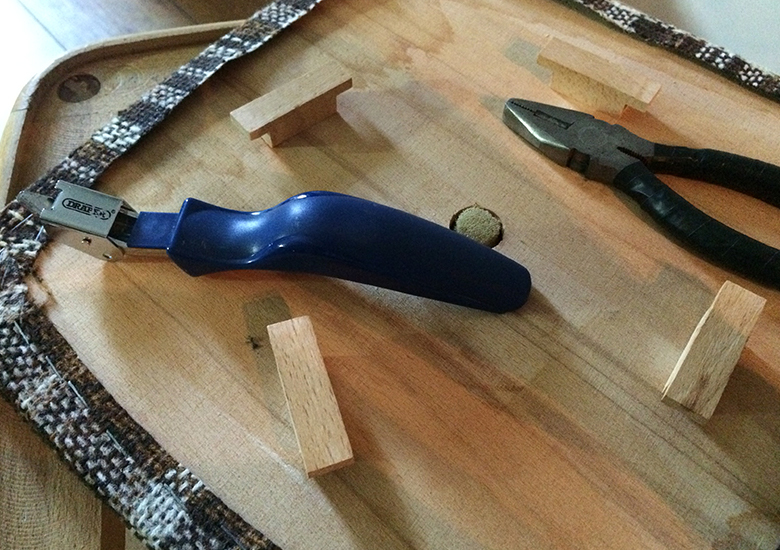 On newer pieces of furniture fabric is usually stapled in place. I used a staple remover and pliers to carefully remove all of them. With some reupholstery projects it is often a good idea to keep the old fabric to use as a template for cutting the new fabric; but as the shape of these seats were very simple it wasn’t necessary. 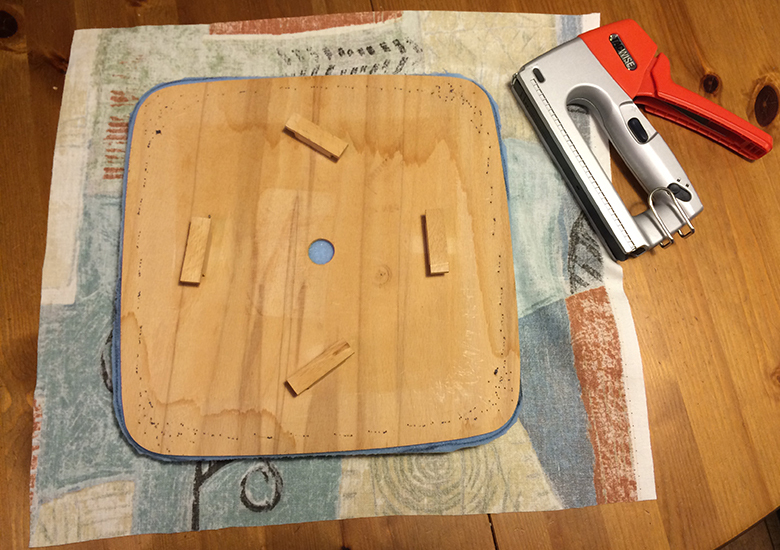 The next step was to cut a new piece of foam. 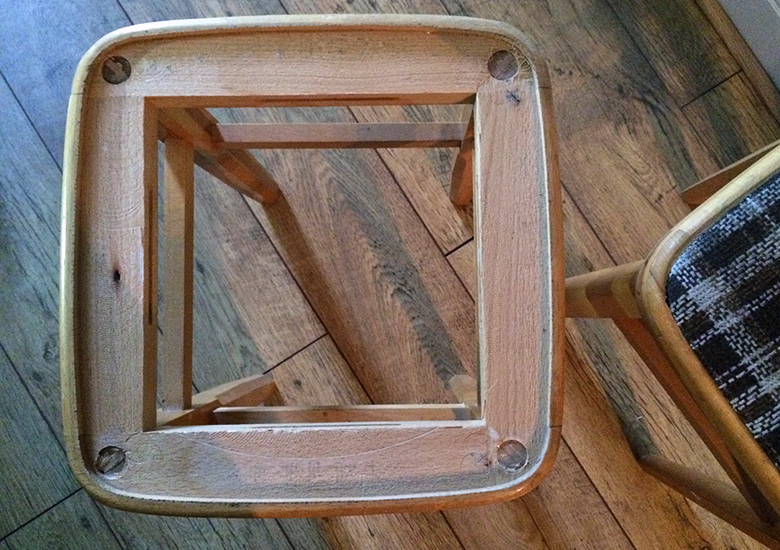 The 1950s stool generally has a thin foam seat. However, this isn’t always as comfortable, especially if you’re planning on using it for more than occasional use. 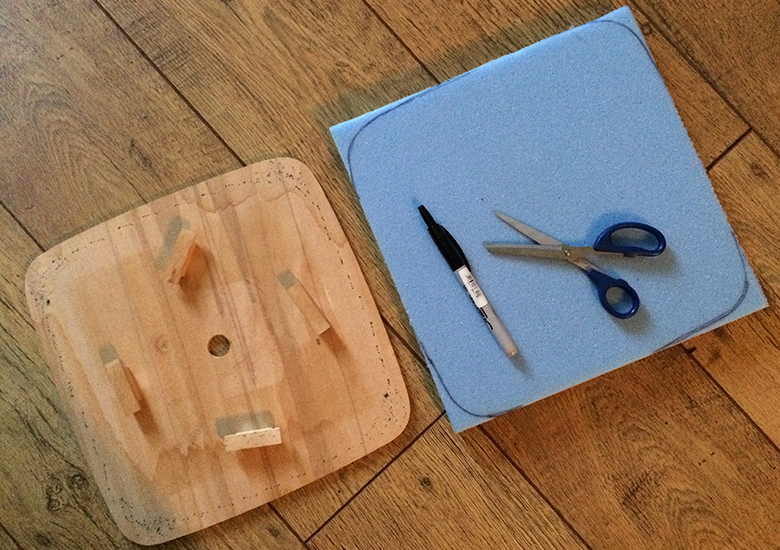 The foam I used was 1.5″ thick and was pre-cut to a square shape. I then drew around the seat with a black marker pen and cut around the corners with scissors. As an alternative to scissors you could always use an electric bread knife, which is more useful for thicker foam. I used a strong adhesive spray to fix the foam to the seat, which I did outside in the garden. 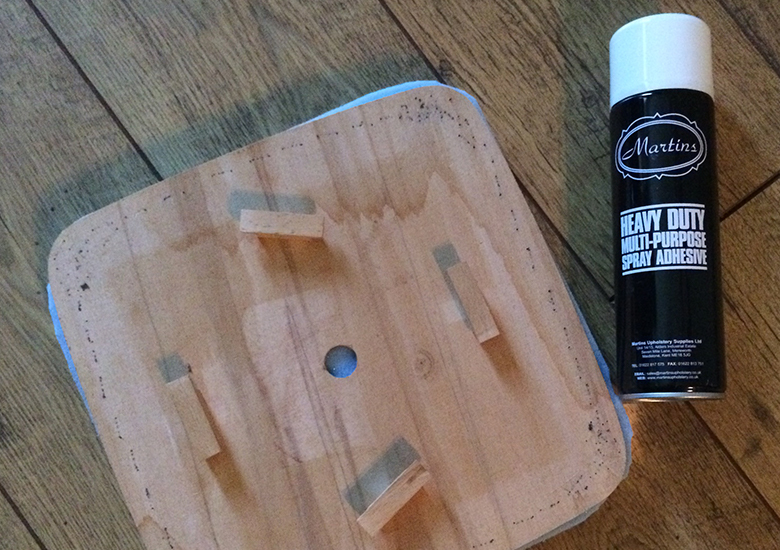 As the spray is very sticky I put down a plastic sheet under the seat before spraying. 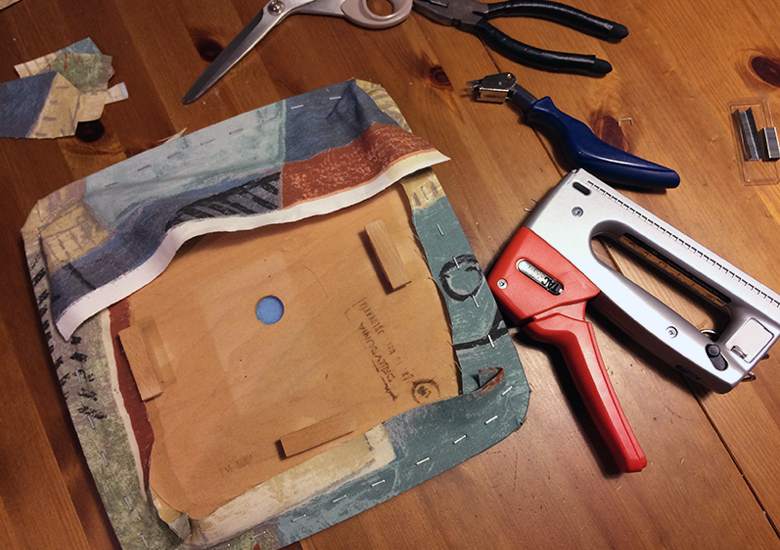 The next step was to cut a new piece of fabric. 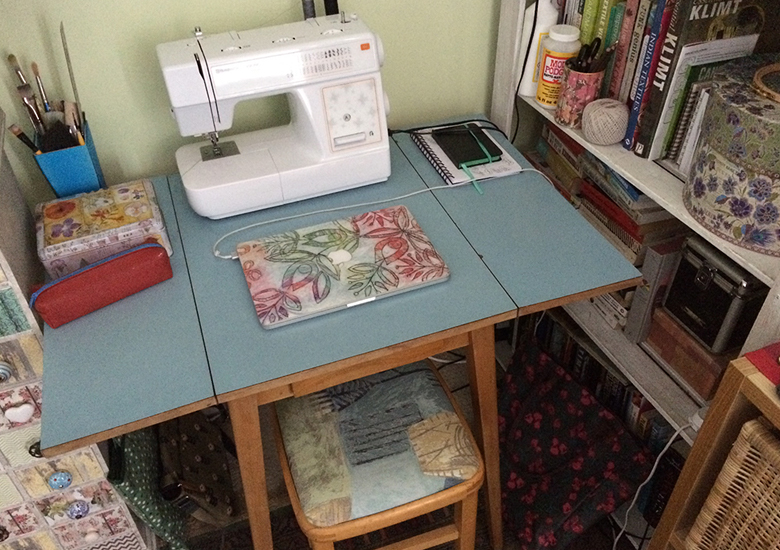 I positioned the seat on top of the fabric and cut around it leaving a border of approximately 2″. The next step was to attach the fabric. I always work on the edge furthest away from me as I can use my body to push against to create a consistent tension when pulling and stapling the fabric. I put my first staple in the edge directly opposite me (i.e. the ‘north’ position), folding the fabric over and placing one staple in the middle about 1/2″ from the edge. I turned the seat 180 degrees (so that ‘south’ was at the top) and pulled the fabric tight and placed one staple in the middle. I then repeated this process for the ‘east’ and ‘west’ of the seat, giving me four staples to anchor the fabric in place. Beginning from one of the middle staples, I then pulled and smoothed the fabric while stapling along the edge working towards each corner, leaving about 1″ away from the corner. I repeated this step until I had stapled along all four edges. I then stapled the corners and trimmed off any excess fabric to prevent the corners from being too bulky and finally trimmed off any excess fabric from along the edges. I put the drop-in seat back on the base and fixed it in place. These are my finished stools. The stool is a perfect fit for my little creative work space.